One of the best things about decorating a home is the ability to tailor it to your own taste and sense of style. 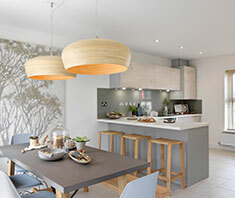 There’s no right or wrong way to go about your interior design with trends changing all the time, and new styles represent a whole host of possibilities rather than having the whole interior design process dictated according to budget and space restraints. 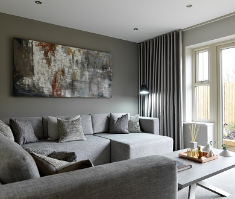 The “less is more” minimalist approach to interior design is one that resonates with a lot of homeowners, especially first time buyers who have invested in their own homes and want to keep things as natural and uncluttered as possible. As an interior design style, minimalism only really came to prominence in the late 1960s and early 1970s taking the popular American art form and adopting it in the way new homes were styled. Unlike a lot of themes that have come and gone, minimalism is every bit as popular today as it was when it was first utilised in homes around the world. As recently revealed in our Strata survey looking at interior design trends for 2019, minimalist design is one of the most popular styles in the UK with 53% of our respondents saying that they favoured a minimalist approach when it came to decorating their homes. What Makes Minimalism So Appealing? Perhaps one of the main reasons why minimalism is so appealing is the effect that a cluttered home can have on us mentally, with numerous studies showing how a disorganised home with items everywhere can lead to feelings of stress, depression and anxiety; even contributing to us not wanting to go home and relax at the end of the day. So that’s just one good reason to adopt a minimalist approach to interior design, but what actually is minimalism and how can you decorate your home with “less is more” in mind? Let’s take a look. How About The Financial Aspect? 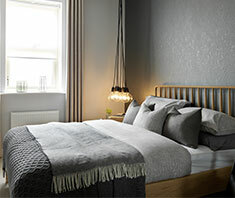 Money is, of course, a key consideration when it comes to interior design and redecorating a home. No homeowner wants to be spending more than they have to on paints, wallpapers, furniture or possessions; so in that respect the less is more approach is one of the most appealing styles. That isn’t to say that you don’t spend any money on your decoration, though. A naked or feature wall can draw the eye, leaving the rest of the room looking clean and stylish in its own right. Mirrors, wall-mounted televisions and fireplaces also used to provide some key features and a unique look within the room rather than splashing the cash on new furniture and possessions throughout. How Can I Adopt Minimalist Design At Home? Open up space by down-sizing your furniture or possessions. Items such as sofas, bookcases and coffee tables can be stylish but they can also take up a lot of space – do you really need them and, if so, do they need to be that big? You could always look for a smaller version. Experiment with new, lighter colours. Dark colours can make a room seem very small so try out some new variations with some tester pots before you get started. It’s also a great time to take a step back and assess the shape and feel of the room with all of the furniture out of the way. You could always use one of the darker colours, if it’s your favourite, as your feature piece. Implement a few tasteful additions rather than going all-out with the decorations and home furnishings. As mentioned, a cluttered home can result in stress and anxiety, so rather than filling a home with all kinds of items, opt for a few tasteful pieces to draw the eye and add splashes of colour. Assess what you’re keeping, and find it a home. Putting things away in their rightful place can make a real difference. When you empty the room ahead of decorating, go through your items and decide what you’re keeping and what’s going. Then whatever you’re keeping can be found a home to help with the new clean and clear theme. Resist the urge to buy all-new furnishings. Unless you’re buying a new home you’re likely to have a lot of furniture and furnishings already, so rather than buying all new items and adding to what you’ve got, assess the condition of what you already own and you’ll save both space and money.